Perk up your daily grind with this adventurous set of four exotic coffees. 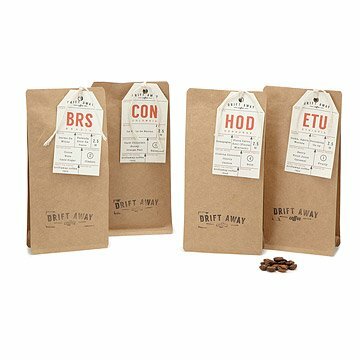 Perk up your daily grind with this adventurous set of four exotic single-origin coffee from Ethiopia, Brazil, Colombia, and Honduras. Perfect for java enthusiasts eager to savor the subtle aromas and flavor profiles that make each regional roast unique. Four 2 oz. coffee packets. Makes approx. 16 cups of coffee. Assembled by Anu Menon and Suyog Mody in Brooklyn, NY. Complete set yields approximately 16 cups of coffee. Please note that the countries available within this set will vary. These smell so so great! Haven't tasted them, but was really pleased with the labeling and the aromatic presentation! I have not seen the gift. I had it shipped to my mother. She called to say that she loved it. It motivated her to try new things. Will order for friends and family. Great set of coffees with different profiles from light to dark. All have such a great flavor! My only dislike is that the labels that tell you the origin of the coffee are not written on the bags. Once you open each bag the labels pull off with no easy way to reattach them. I know this is minor, but it would be nice to have each bag labeled. Otherwise loved this set and so did my man. Got this for my sister-in-law for Christmas and she LOVED it. It comes in whole bean form, which is ideal for coffee lovers. The packaging is cool & it includes where each coffee is from, the different flavors each contains, and even tips for best brewing. Definitely recommend.